Sure I was a little disappointed, but my heart would never stop dreaming of those Mexican beach pebbles, one day I’ll come for you my little Mexican beach pebbles! I promised myself. Finally the day came for us to have our curbing done. To make sure I didn’t make the mistake of not doing enough research, or asking enough questions, I called around and read LOTS of reviews. I came across Skinner Curbing who had been doing for 20 years, came highly recommended, had great reviews, all of their work looked amazing and it was consistent. When I called to schedule, they got me in right away. They asked me to remove any rocks and give then about twelve inches to work their curbing machine. To get the yard ready, we (Nick) took an old serrated knife and trimmed what we though looked like a good line and curvature in the lawn and we were feeling ready to go. I had NO idea what to expect but the professional team from Skinner Curbing asked me what I wanted to do, he asked which style, pattern, color options I wanted. Honestly I had no idea there were so many options for curbing! 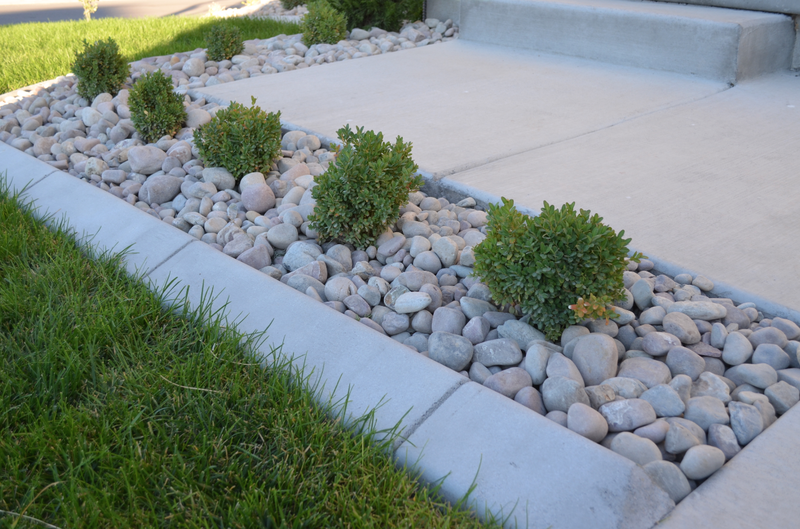 I chose a sloped edge curbing (to match the pool house curbing) and kept it clean and simple. They even went through and added a better shape to the lines we made, I’m so glad they did because it looked so much better. To make the curbing, cement is added to the curbing machine and they create all of the rows and curves. They go over the rough curbing with special tools to make it smooth and uniform. They finish by adding lines in the curbing to help it settle correctly and to prevent cracking. The curbing alone made such a big difference in the curb appeal. So about those Mexican beach pebbles… I looked online and apparently Mexican beach pebbles go for around $600 per cubic yard…ouch. The landscapers weren’t kidding about those being WAY over budget. So I started looking for a plan B and went to American Stone in Lehi, and asked to see what they had. I fell in love with this Montana river rock. Montana, Mexican, close enough right!? These Montana river rocks look lighter in color normally, but when they get wet all of the purple, blue and rose tones come out. I honestly couldn’t believe what a difference the curbing and smooth river rocks made!